I did it! 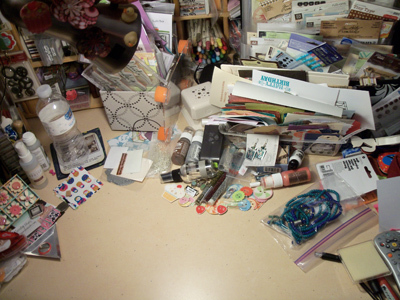 Two weeks in a row I’m posting for What’s on Your Workdesk Wednesday. It’s not a perfect model to only post once a week, but it’s a start. And I’m moving in the right direction. If you don’t know what WOYWW is, go and check out Julia over at Stamping Ground. Go Ahead, I’ll wait. Just come back to see me! The “laptop space” I had last week is long gone. Good thing I have a tablet. There’s just enough room for that! Is that an actual project I spy?!? 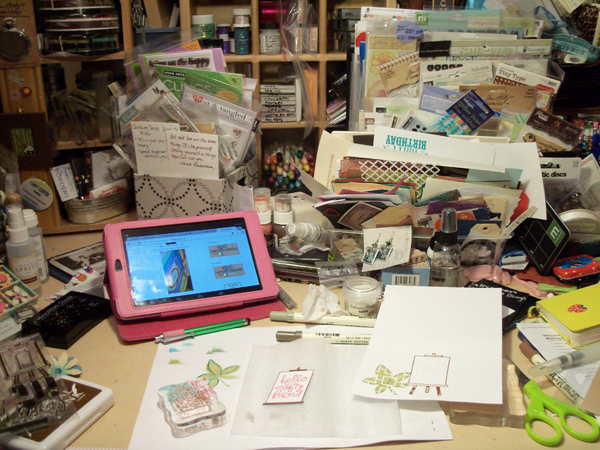 I’ve been meaning to join in and post for What’s On Your Workdesk Wednesday. It’s hosted by Julia over at Stamping Ground. 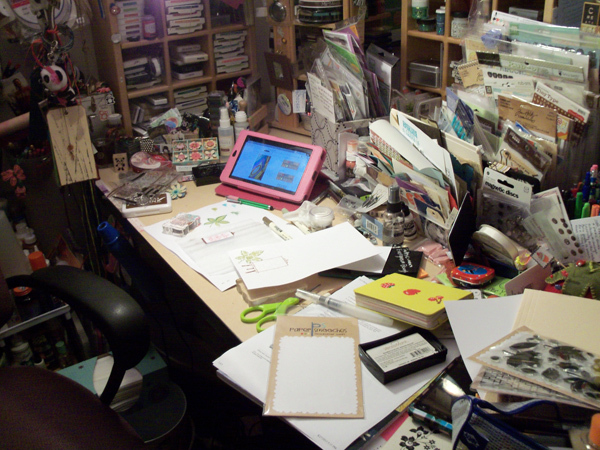 Every Wednesday you take a picture of your workspace and then post it. 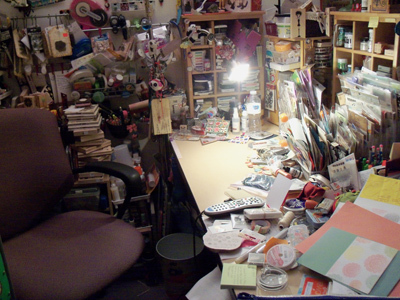 I’ve always found others’ workspaces really interesting. 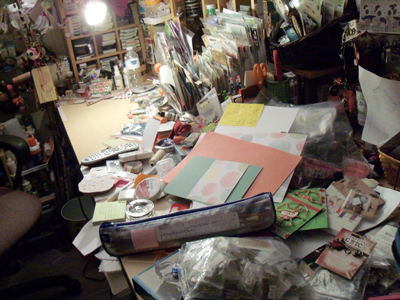 It’s fun to take a peek into another’s creative space. It’s like being a little crafty peeping tom. Here’s your look inside my little window. The ONLY reason there’s space there, is my laptop was there as of yesterday. In the baggie is the rest of the necklace I need to make into earrings and a bracelet for my pseudo-mother-in-law. I’m trying to use my new-ish Sticker Stadium so that’s getting filled up. I just opened a really old epoxy button and chipboard set to get at the cute little cupcakes to make a Thank You card for my trainer. If you think it looks crowded now…you have no idea. Did I mention this table is 6 feet long? And it’s at least 5 1/2 feet full. Crazy, right? I know. You’d think with all that space, I’d have plenty of room for everything. It’s pretty much the opposite. I keep setting stuff on there that I “really should use”. See those papers in the bottom corner of the last picture? Those have been in a pile to make-something-because-aren’t-they-all-pretty-together for…well…as long as I can remember. Now that you have all seen where I work, I should really get to making something!